Isn’t it funny how we count down the days until school gets out for summer? And then we count down the days until school starts again? We have one more week left until school starts. I love my kiddos dearly and we have had such a fun summer together, but I can’t wait to get back into a routine again. Not only that but these kids sure know how to eat! They haven’t even reached the teenager eating phase yet and I feel like they are eating me out of house and home. We have to go on a weekly costco run just to keep up with their demands. With how much these kids eat I have had to get creative with dinner time. I think they have just about had enough of Taco Tuesday. So I love to make slow cooker meals. We have about two a week! It is so easy to just throw everything in and have a delicious dinner ready by 6. I sure do love my slow cooker. But let’s just get into this recipe. 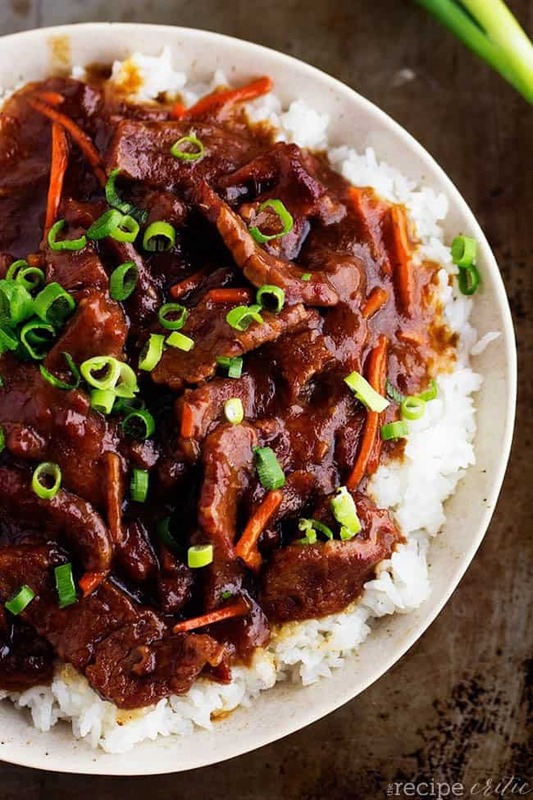 This is hands down one of the BEST things that I have ever made in my slow cooker. Ever. First of all this is SO easy to make with minimal ingredients. It is simple yet full of so much flavor! It took me less than 5 minutes to throw it in the slow cooker. And then I just let it do its thang. And then the beef. OMG the beef. It literally just melts in your mouth! It cooks so tender in the slow cooker. And then the sauce is incredible. As I was eating this I kept thinking… there is no way that you could make this and not fall in love! Everything about this recipe is perfect and I know that it will become a family favorite at your house just like it did at ours! You don’t have to go to a 5 star restaurant to get it either. You can make it right at home and have it be the star of the dinner table! Cut flank steak into thin strips. In a ziplock bag add flank steak pieces and cornstarch. Shake to coat. Add olive oil, minced garlic, soy sauce, water, brown sugar and carrots to slow cooker. Stir ingredients. Add coated flank steak and stir again until coated in the sauce. Cook for high 2-3 hours or on low 4-5 hours until cooked throughout and tender. Can serve over rice and garnish with green onions. I’ve made this twice, once in my slow cooker, and also in my Instant Pot under pressure. Both were so quick and easy I’d feel ashamed to call myself a cook if it weren’t so delicious. As a bonus, it makes a great freezer meal. After serving it for dinner tonight I caught my husband licking his plate. I think that says it all! Ooo how long did you cook it in the instant pot?!!!? How long did you cook in the Insta pot. Yum! How long did you cook in the instapot? How did you adapt this for the Instant Pot? I dont have cornstarch..do you think I could use flour? SANDY TOES can you please tell us how you made this in the Instant Pot?!? Many of us would love to try cooking it that way. Need to know how long you cooked under pressere, also did you quick release or natural release? Did you make any changes to the recipe? Someone said that the cornstarch coated meat burned when they tried it. Thank you! Can you make this in an instantpot? In the IP you have to do the cornstarch with water at the end on site. Looks delicious can’t wait to try it. “This reminds me Asian junk food” said my husband who used to travel to China. I would use 1/4 cup less sugar as it is really sweet. I also used coco aminos in place of the soy sauce to make it Gluten and soy free. Delicious! Looks very delicious and simple! Must try! But…I don’t have slow cook pot/ instant pot. Can i use non-electric roasting pot. If yes, What’s the temp and time instructions i should follow? This is the tastiest and easiest recipe I have found in some time! My whole family loves it. Thanks! I will try it but i want to know should i make it in electric cooker. and if i can cook it in electric cooker than for how many minutes i have to cook it. thanks by the way you explain it very well. Cooked this once.It was really good! 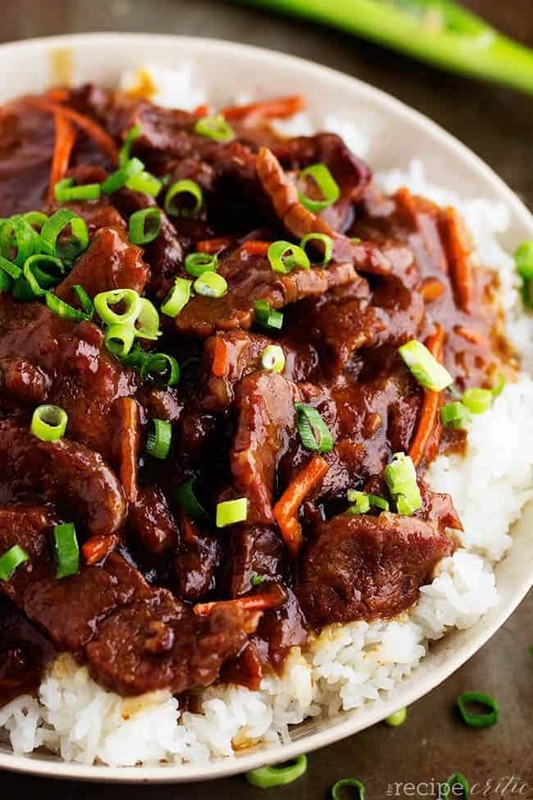 I love this Mongolian Beef recipe! Everyone I make it for raves, and it beats anyone else’s hands down! They even wanted to save the sauce (with nothing else left) for pouring over rice. I do have 2 suggestions, how I tweaked the recipe. I have the Crock-Pot that let’s me use it on the stove top (not the regular crock), and I coat my meat first, then lightly and quickly cook, just to sear in the flavor, then, (my second tip), I prefer my meat more medium than done, so I cook everything together, including the seared meat, on high, but usually for just an hour. (Cooking it on low for longer will make the meat well done). When the meat is cooked longer than that, it becomes chewey and loses the good flavor. I have made this twice and am making it again tonight. We Love it! It is a little too sweet though so I am cutting back on the brown sugar tonight! Easy recipe! How do you re-write a Slow Cooker recipe into an Instant Pot recipe? I somehow managed to miss the low sodium part of the soy sauce ingredient. Needless to say my results were a bit salty. But it still so delicious I will definitely make again! Isn’t Monglian Beef supposed to be spicy? What do I use to make it spicy? Thank you! Am I missing something? The regular recipe has ginger in it, but the crockpot doesn’t. Is that right? I made this for my husband and he loved it! He was still talking about it the next day! I will definitely add this to my permanent recipe list! 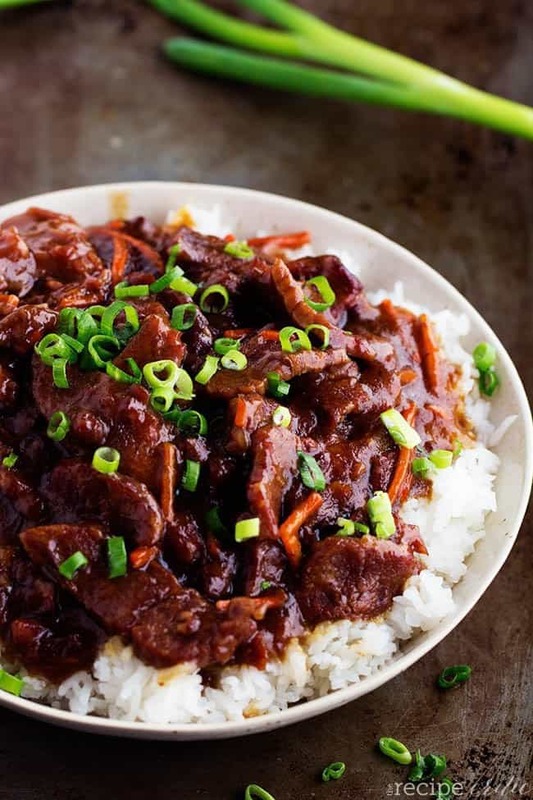 Alyssa, love the Mongolian beef in slow cooker! I am on a diet and have a Fitbit. Would you happen to know the calories on this recipe? Hi, Can this be left in the slow cooker on ‘warm’ for several hours without ruining it? I work all day and have to set the slow cooker before I leave (so if I cook on low for 5 hours it would be on ‘warm’ for another 51/2)? If not, do you have any slow cooker recipes that will work for working moms? 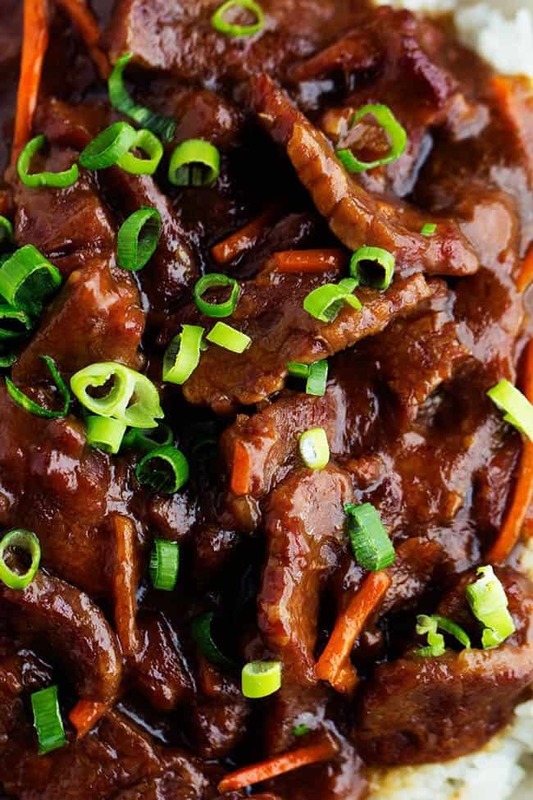 I made this Mongolian Beef, and it really is to die for! I made three small changes to it. First, I love onions, though not necessarily part of the dish, I added them to the crock pot. I have a crock pot that is made to also be able to use of the stove. So, after coating the meat in corn starch, I very lightly browned the beef in just a bit of olive oil. Lastly, I only cooked this on high for 2 hours, to keep the meat from being well done. I never get tired of this recipe! If you have put off trying this recipe, don’t. This recipe is so easy to make and absolutely delicious. I doubled the recipe and used the high setting on crock pot, cooked for the same amount of time. Fixed fried rice and fresh broccoli for my sides. Family loved it. I will definitely make again and will occasionally spice it up by adding red peppers, or adding fresh ginger for a slight teriyaki dish. YUMMY! If I wanted to put broccoli in with this, would I add it like the last hour or so? Or would it need to be added to the beginning? I would recommend adding it at the very end. Hope you enjoy it! This makes about 6 to 8 servings on average. If I double the meat to 3 lbs, would I just double all other ingredients? And what about cooktime? I have a diabetic granddaughter and wonder if someone knows of a substitute for the brown sugar? Would love to make this! I made it with Splenda brown sugar worked great. If I use 3 lbs of flank steak , do i double all the other ingredients ? And how long should I cook in slow cooker ? Yes, you will want to double the other ingredients so you have enough sauce for the beef to cook in. Has anyone tried this with round steak? I have one in my freezer so wondering how it would be in this recipe instead of flank steak…. Love this recipe! I added onions, sliced mushrooms, ginger and chili flakes. Also cut the sodium by using just 1/4 C soy sauce and added extra water with a beef bullion cube for flavor. Reduced the amount of brown sugar and the flavor did not seem to suffer for it. Finished with the scallions and also some fresh parsley for freshness to garnish. Excellent and very tender after just two hours on high in my slow cooker. I wish you would add the nutritional information with your recipes. I would love to include some of these meals into my Faster Way to Weight Loss Diet but I need this information to do so. I am sure I am not the only one who would like this included. Can i marinate the meat a day or two ahead of time? I want to prep ahead and was curious. Yes, that sounds fantastic! Let me know how you like it! This was delicious and the whole family loved it. Meat was perfectly tender after 4 hours on low setting. I made Mangolian beef. It was a hit recepie on dinner party. Everyone loved it. Does the recipe really need the olive oil? You can omit if you would prefer. I live in Australia and would like to know what flank steak is as we must call it something different here.. It is also known as skirt steak or London broil. Hope that helps! Let me know if those two don’t sound familiar either. I made this exactly as written, it was SO good! I served it over rice with crisp tender broccoli. Everyone loved it, and I’ll be making it again soon!! Can you use another meat, similarly sliced, like stew meet, tip steak, or roast? Yes, of course! Let me know which one you choose! I have not tried it with chicken breast. You are welcome to try it with chicken breast, however, I would not recommend it. I have not tried it with chicken but I would not recommend it.